Yes…you read that title correctly. Chocolate bourbon pecan pie. And it is every bit as delicious as you would imagine. It is Thanksgiving and Christmas and all good things rolled into one. It is traditional pecan pie but so much more. I came across this recipe one lucky day…before pinterest. Shocking I know!! I gave it a try that Christmas and we were blown away. Friends who came to Christmas dinner wanted to take an entire pie home. It is that good. The best thing about this pie is that it is easy to prepare and yet it tastes so fabulous it seems as if you have spent hours preparing it. This pie will have people beating down your door to be friends with you, get you into the best holiday parties, heck it is so good they might throw a party in your honor!! Ok…I may be embellishing a little but I assure you making this pie for your friends and family can’t hurt anything. Oh it is so good. So give it a try. I promise you have totally got this! 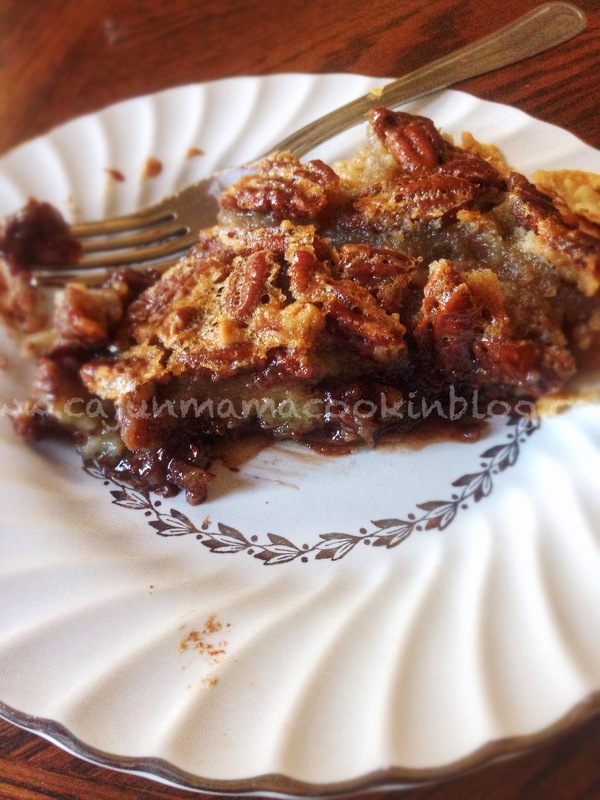 So get to baking…Cajun Mama says so. Sorry…I know that was bossy…but I like to pretend ya’ll listen to me…the people who live in my house with me certainly don’t. I am pretty sure they hear a series of dolphin squeaks when I speak. Ha ha! But really…sigh. Whisk together eggs, light corn syrup, and the following 6 ingredients until mixture is smooth. Stir in chopped pecans and chocolate chips. Pour into pie crust. Bake on the lowest oven rack for 1 hour or until set. Mine took exactly an hour and then I let it cool for about 45 minutes and it was perfectly set. Yeah…it is even better than it looks. Promise.